So a few weeks ago I whittled on about how you can save money on all sorts of baby stuff. And something I've learned is that there's just no point spending oodles of money on ridiculously pretty and pricey vests and grows that will undoubtedly get ruined (it takes just one colossal baby poo to do it). Instead I buy all my essential vests/grows/leggings like these gorgeous long sleeved body suits http://www.hm.com/gb/product/23172?article=23172-A for super cheap but splurge a bit on nicer cardigans, jumpers and little jackets that might see my baby through a whole season. And this week, whilst my beauty editor friends were waiting with baited breath to check out what Peter Pilotto and Target had come up with for Net a Porter, I was super excited to see what the Paddington Bear and babyGap collaboration was going to bring about. Yes, forget high fashion, these days it's all about cute-as-a-button baby booty. 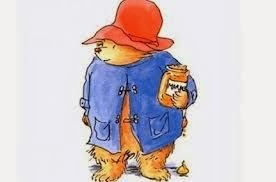 Paddington Bear you say? BabyGap? Seriously, what could be cuter? (or cleverer - hats off to Gap). And as if to prove a case in point, it's the perfect range to spend a little more on if you're after an essential item or just something you absolutely love. Saying that, there is SO much to fall in love with in this collection, you might find it hard to know where to start (or when to stop). 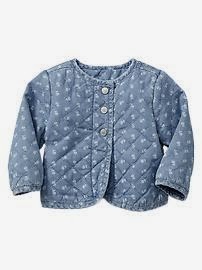 I personally love this Quilted Denim Jacket, £29.95, which will be perfect for when Spring arrives and Elsie is no longer tucked up in her all-in-one. It's a bit Isabel Marant no? And there are loads of pretty Paddington-esque cardigans, leggings and even a teeny trench coat, which I LOVE but reckon getting a six month old in and out of it might be more hassle than it's worth. Anyhow, it's all pretty adorable. Find the range here http://www.gap.co.uk/browse/category.do?cid=1006703&departmentRedirect=true&kwid=1&sem=false#department=166 and be quick as I reckon this lot will fly. It's such a gorgeous collection isn't it! I've fallen in love with so many pieces, good job there isn't a GAP nearby! !